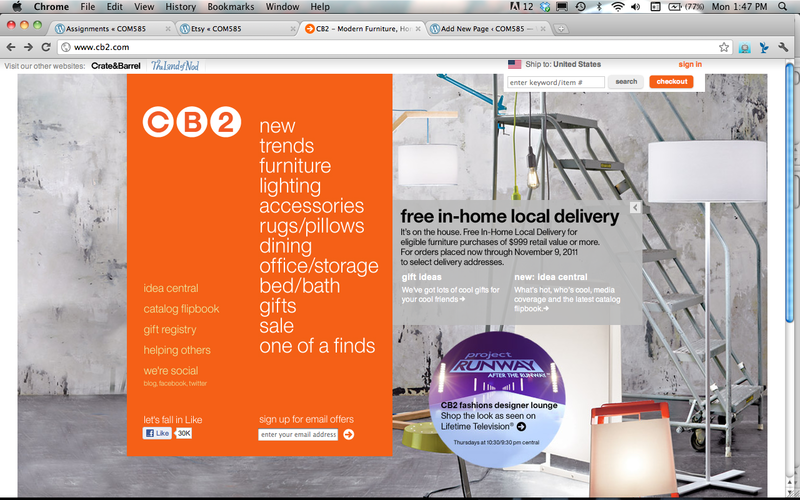 CB2 offers new, modern furniture and accessories for consumers offering free in home delivery for purchases $999 and above. In addition to furniture, they offer lighting, bed and bath, and gifts. They have an online catalog as well as gift registry. Mission: CB2 is a community seeking modern home design that’s clever and in the moment, that’s spare and simple but with great attention to details, that’s priced smart so we can all have it all (and feel smart doing so). The only attitude you’ll find at CB2 is creative, fun, happy to share. Design is elegant and modern using professional imagery and simple navigation. Users can easily navigate through specific catalogs targeted to the various products offered through the site. Keyword search is available as well as a sign-up for email promotions and special offers. Upper middle class, fashion-conscious homeowners. To mix, play, and live with emerging trends by providing new color and scale for spaces small and large. There are links on the home page directly to their Facebook, Twitter and blog. Additionally, users can “Like” the Facebook page directly from the homepage. 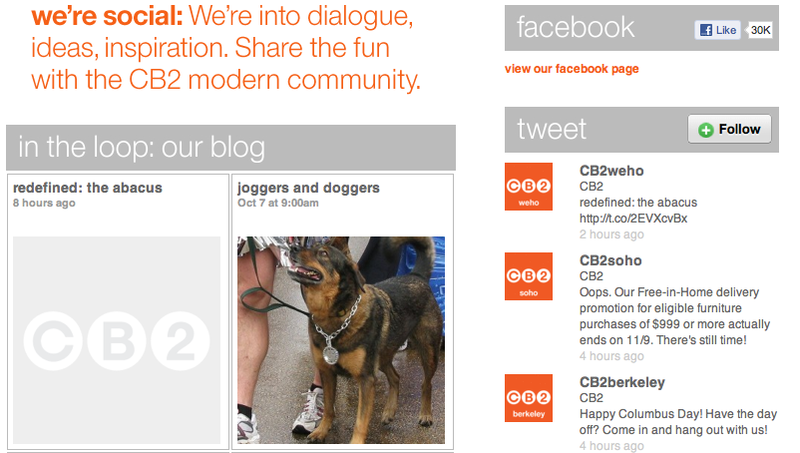 CB2 has links to their blog, Facebook and Twitter from their "We're Social" page.